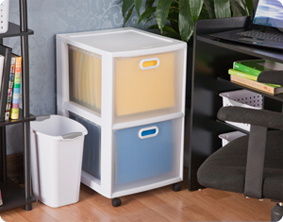 The 2 Drawer Ultra™ Cart accommodates letter sized hanging files to help bring order to your office or home work space. This practical and versatile storage solution features clear, stylized, textured drawer fronts with clear sides that allow items to be quickly identified. The attractive styling makes them an ideal organizing solution for any area around the home including living rooms, bedrooms, offices, and more. Keep your files organized and easy to find when neatly hung in the Ultra Cart's deep drawers. Or use the drawers to keep paper, craft supplies, accessories, and office / school supplies contained. Use the included casters to create a rolling storage option, and easily move the Drawer Cart wherever it is needed. The overall dimensions of this item are 18" x 16" x 24 5/8". Overall Assembled Size: 18" x 16" x 24 5/8"
If you have a home office then this File Cart is ideal for keeping your desk cleared of unwanted paperwork while organizing bills and receipts so you can find them when needed! 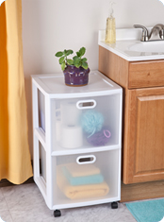 Ideal for organizing extra towels, toilet paper and other essentials in the bathroom. The textured pattern helps to conceal contents. Need a way to store knitting or sewing patterns so that they can be easily found? Set up files and then organize patterns by size, style, etc., or utilize Carts to organize supplies and keep work areas clear. Ultra 2 Drawer Cart is rated 5.0 out of 5 by 2. 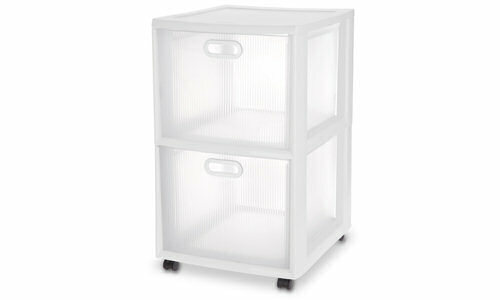 Rated 5 out of 5 by DOROTHY from Use as file cabinet I have 4 of these I use as file cabinets. I run an office from my home and need a place to temporarily store some of my files. These work perfectly for file storage. They have the slots for using pendaflex hanging files. They move around easily and are sturdy enough to hold many files. My only problem is that most stores (like Walmart) do not regularly carry them. I sometimes have to go on a search for them. It is worth it though because I like them so well. Great product, very useful. Rated 5 out of 5 by DMF1567 from File Drawer This file drawer is my latest buy. I needed something for my files, but I didn't want to spend a lot of money and this fit the bill. 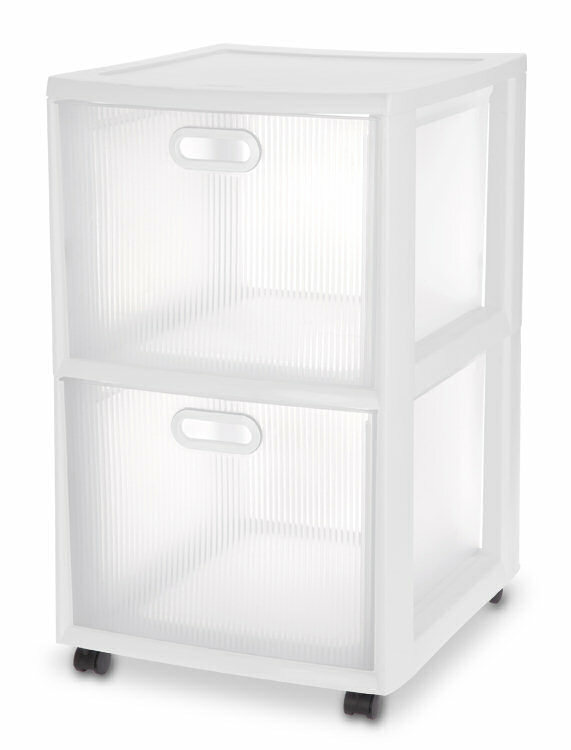 It is sturdy and doesn't tip over if you only have files in the bottom drawer. The drawers have "stops" on them, so they won't pull out all the way and onto the floor. It's on wheels, so I can move it anywhere I want. Large enough to accommodate a ton of files, small enough to hide it in a closet if needed. Love it and I would recommend it!